Any TACO lovers out there? Yes…me…everyday….all day. Tacos are EVERYTHING, y’all! Today we’re making delicious tacos in bowl form with these healthy and savory Mahi-Mahi Taco Bowls! I’m thinking that the Sriracha Lime Shrimp Tacos and Spicy Salmon Tacos need to make their appearance in bowl form pretty soon, too. Wouldn’t that be magical? Meanwhile, these Mahi-Mahi Taco Bowls. All the delicious, happy feels with these babies! Especially since they’re topped off with my latest (ok, always) obsession – Guac! It makes the world a better place, y’all. For this recipe, I used GOODFOODS Tableside ® Chunky Guacamole! I found it at Target and my life was forever changed. Literally – it tastes so fresh, as in just-made fresh with no artificial ingredients and straight goodness! Trust me when I say that you need this in your life, friend. Seriously. This guac is no joke! Head over to the GOODFOODS website for more info or to your local grocery store to get in on this good stuff! OH and btw, these Mahi-Mahi Taco Bowls make  dinners or snacks for game day! If you’re having a ton of people over for the big game, you could even turn these taco bowls into a DIY taco bowl bar. So fun! A couple of notes about the recipe: I actually used frozen mahi-mahi fillets that were super easy to cook. I also added some crushed tortilla chips to each bowl for a little extra fun! Bake the fillets according to package directions. While the fillets are baking, cook the quinoa according to directions. 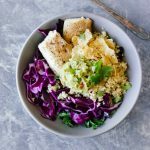 In 2 bowls, combine the chopped lettuce, red cabbage, fish fillets, cooked quinoa, guacamole, crushed tortilla chips, and cilantro. This looks delish!!! I love fish tacos and this looks healthy and simple. Thank you!